With the discovery of gold and the Mexican-American War’s conclusion in early 1848, the Mexicans’ bucolic rancho life came to an end. A non-Indian California population of 14,000 swelled to several hundred thousand by 1852. These new Californians needed food, so cattle, sheep and vegetables had ready markets. Prices were high. For example, in the early 1850s, apples sold for $1 each and cherries went for a dollar per dozen. The price of beeves soon reached $500 at Sacramento; in 1851, cattle were only worth $50 to $150 each. An estimated 3,000,000 cattle grazed the state’s hills and valleys by the early 1860s. Sheep herds grew to over one million in the same period. Large cattle herds from the lower Mississippi valley and southwest were driven overland to meet the demand for beef. Albert Stone, who eventually settled in Alamo, was one of those who drove cattle to California when he came for a second time in 1853. These cattle gradually altered the types of cattle in the state as meat became more valuable than the leather hides. The rancheros had seen no need to actively improve their abundant stock. The new breeds were usually "British" beef breeds: Hereford, Angus and Shorthorn. The first pioneers from the gold mines settled in the San Ramon Valley’s open country. Early writers recorded seeing numbers of wild cattle and grizzly bears. The settlers grazed animals and began to plant crops for sale, particularly wheat. Jose Maria Amador and Roberto Livermore had cultivated a substantial wheat crop in 1837, but such large plantings were rare for Mexican rancheros who grew grains and vegetables strictly for domestic use. One historian wrote that cattle increased four-fold, from 1848 to 1860. Again the weather came into play. First came a dry year in 1860-61, then huge floods in 1861-2 and a severe drought in 1863-64. Ranchers and farmers looked to raise other crops as California’s "age of grass" became the "age of grain." Valley ranchers grazed livestock and farmed, choosing crops which would sell successfully. They often planted crops on the valley floor and put grain, hay, sheep and cattle on the hills. A three-year crop rotation between grain, hay and pasture became the practice. Crops including barley, wheat, hay were profitable, followed by fruit orchards, beets, grapes, and tomatoes; in the twentieth century, groves of walnut trees and pear orchards dominated the valley floor. "Although the grain-growing interest predominates over all others, stock raising forms no inconsiderable part of the industries of the county. Improved breeds of cattle, horses, sheep, and swine, imported from abroad or from the Eastern States, have given the stock of this section a wide-spread reputation for years past. Many of the finest horses in the State have been bred in this county, and farmers take a great pride in the excellent quality of their stock. But the generality of farmers seem to prefer wheat-raising to all other industries." And later in this article: "Dairying is carried on extensively, and is constantly increasing, and has almost supplanted the raising of cattle for market. The production of butter is greatly increased by the improved method of conducting the business, the better quality of the stock, and the extra care given the cows, as compared with a few years ago." Hay was an important product since "farms with livestock needed to put up and store a ton or so of hay for each cow or horse to be fed the next winter," according to Don Wood. The valley provided hay for animals in San Francisco for many years, making it a reliable source of income for ranchers and farmers until the advent of cars and trucks in the early 20th century. Wood: "The U.S. Cavalry posted at the Presidio, liveries and dray horses in San Francisco created a very big market for good quality hay." "One car load of beef cattle and veal calves was shipped from Danville stock corrals yesterday, and an occasional car load of hay is shipped direct to some consumer, but very little will be thrown on the market this season. A few would-be buyers of hay have been around but cannot pay satisfactory prices at present." Don Wood wrote that "Barbed wire that was developed in the 1870s became generally available in the early 1880s," displacing the split redwood posts "except for corral fencing, as the primary fence materials." Several different types of wire were patented. This economical and easily installed invention altered grazing practices. Ranchers in the San Ramon Valley eventually preferred the latest Glidden style wire. For some ranchers, cattle raising was their primary focus during the 20th century. Frank Macedo Sr. and Jr. owned and leased land at Mt. Diablo’s foothills from Alamo through Walnut Creek, grazing cattle, raising hay and running several dairies. 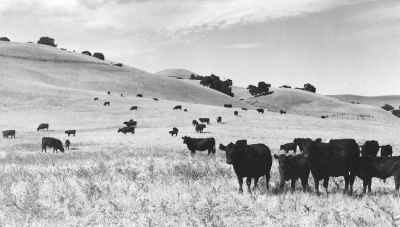 The Blackhawk Ranch grew to 6500 acres by the forties and grazed at least 1000 cattle. Wood Ranch raised both cattle and sheep on 1200 acres. 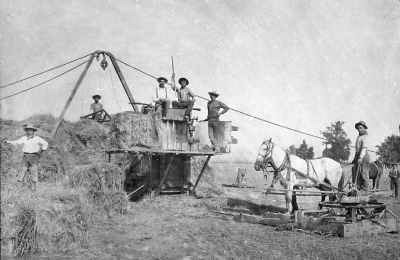 The Dougherty Valley’s 10,000 acres were primarily cattle country with some hay and grain on leased land. To the east, the Rasmussen Ranch grew to several thousand acres. By the mid-century, the Wiedemanns raised cattle on owned and leased property extending over 8000 acres. And the Elworthys grazed cattle on their home place in Danville and several large ranches in other counties. Before World War II, the San Ramon Valley and nearby valleys formed the rural eastern edge of the San Francisco Bay. Vast walnut and fruit orchards covered the valley floor, some of the hill land was farmed, but most of it was grazed by cattle and sheep. In the fifties, the influx of people drawn to the Golden State transformed this landscape. The valley had 2,120 people in 1940 and 28,090 in 1970. Almost all of the farming has disappeared, although the hills are stilled grazed. Rutherford, Richard, "The $$$ Trend, Red and Black, A History of Agriculture in the San Ramon Valley," The Valley Pioneer Centennial Edition, 9-4-1958.